It was quite difficult not to get excited when I heard some of the former employees of Omas had recently decided to start their own brand! 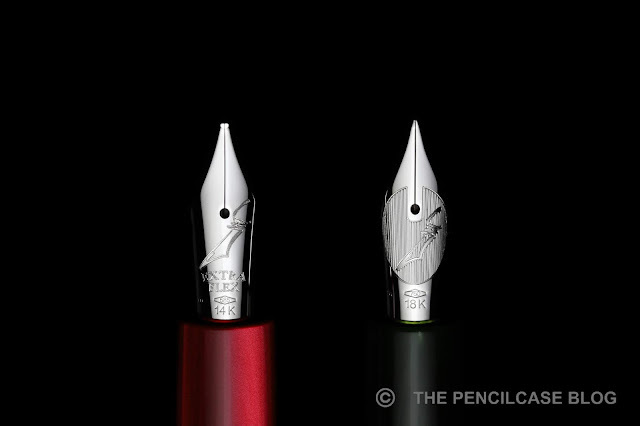 It's been a couple years since the demise of Omas, and the new brand -Scrittura Bolognese (Scribo in short)- seems to slowly be setting its foundations. 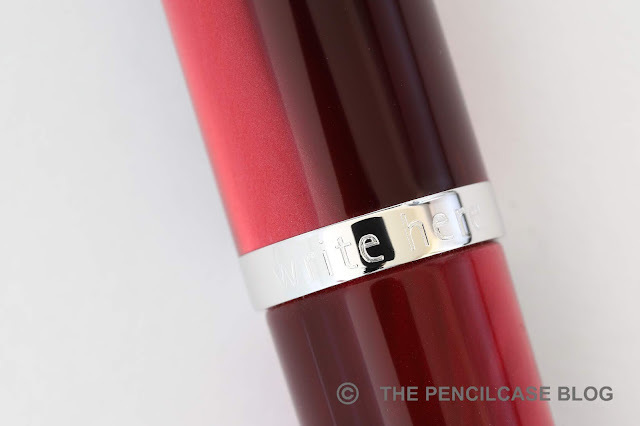 UK-based retailer Write Here and Scribo partnering up, resulted in Scribo's second pen design (although the first, LE Letteratura, is definitely not as accessible in terms of price!). 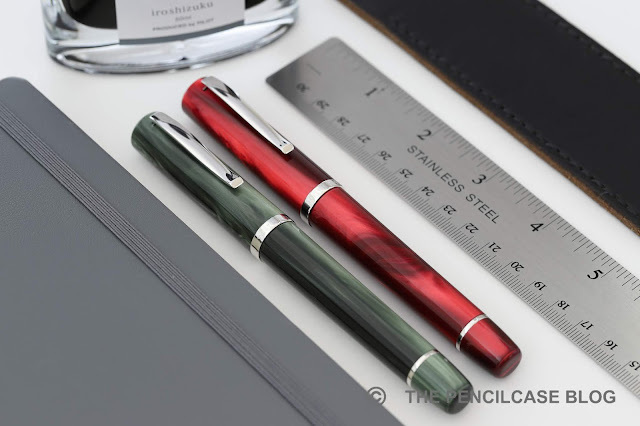 The Scribo Write Here fountain pen, already on its second generation with two new colorways (Cardinal red and noble green), is a large pen with a rather simple flattop design that seems largely inspired by the Omas Bologna. 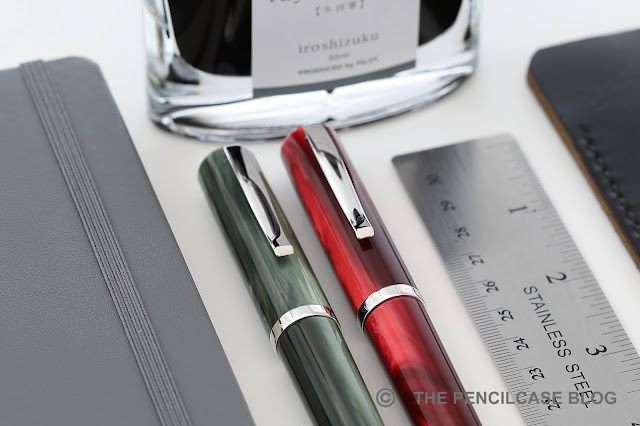 The two new colors accompany the first version of the Scribo Write Here, which is made from grey acrylic, and features a green decorative ring near the piston knob (both colors referring to the Write Here logo). 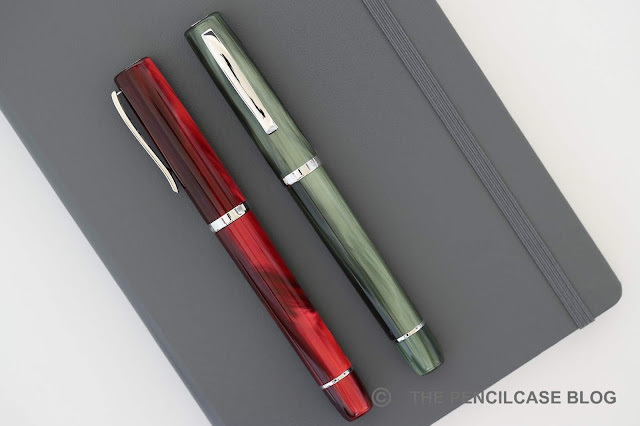 The Cardinal Red and Noble green materials have a strong pearlescence to them, which changes the appearance of the pen depending on how the light hits it (ranging from very dark, to vibrant red or green). 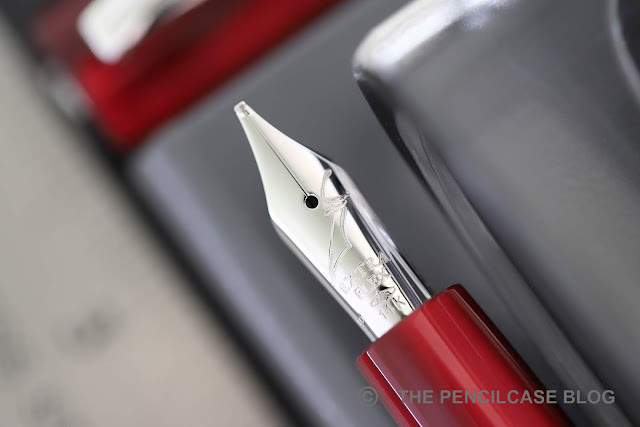 The pen is adorned with a simple, curvy clip (surprisingly not one with a rolling wheel, which Italian pen makers love to use), a plain center band engraved 'Write Here', and a single rhodium-plated ring around the piston knob. The main design element is definitely the cap finial, which immediately draws the attention. 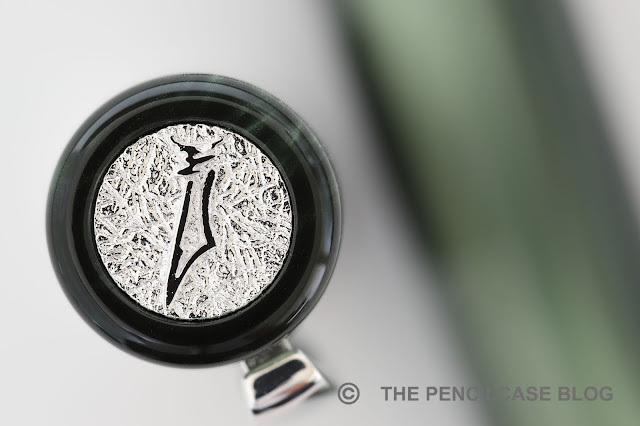 The finial sports the Write Here logo beautifully raised in a textured rhodium-plated 'coin'. The Scribo Write Here is a rather sizeable pen, measuring 14.4cm (5.67") closed, and 13.3 (5.23") uncapped. With a total weight of 34g, it's quite hefty, especially for an all-acrylic pen (although the piston mechanism has metal elements in it, which add some weight). I do tend to typically enjoy larger pens, so this one fits right in. I found it to be the perfect size unposted...luckily, because you can't post it. 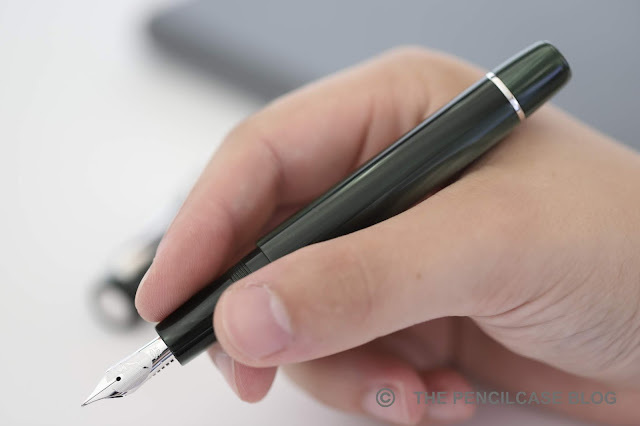 The Scribo Write Here is a remarkably comfortable pen. 'Remarkably', because I was initally worried about the section. It's very straight and is followed by a rather sharp transition from section to barrel. Luckily, the threads are shallow and almost not noticeable. The section is also long enough to allow you to grip the pen far away from the step, so in the end it didn't bother me all that much. Together with the nice size and subtle heft, it sits comfortably in my hand. My least favourite part of the entire pen is (and really the ownly downside I could find), IMHO, the clip. I really like the minimal, curved shape of the clip, and I think it follows the design aesthetic of the rest of the pen quite well. But structurally, it doesn't feel as durable as I would've hoped. It's very springy, and the shape allows it to clip onto things quite easily. But at the same time it feels like it might snap off if you accidentally put a little bit too much force on it. The highlight of the Scribo pens is of course the nib. Being the birthchild of ex-Omas employees, they took all the knowledge they had about making nibs and poured it into a nib that is basically identical to the ones Omas was known for. I tried both the 18k and 14k flexible nib, and both are excellent in their own respect. The rigid 18k nib features a beautiful engraved logo (again the Write Here logo), and is an exceptionally smooth and juicy writer (especially for a fine nib!). But in the end, I went for a 14k flexible broad nib. Not the most sane option for everyday use, but fantastic, fun writer nevertheless! It's extremely wet and has a nice bouncy softness to it. The softness adds a lot of character to your writing, and provides some line variation when you apply gentle pressure. Vintage flex it is not, but I think you'd be hard-pressed to find something better than this in a modern nib. The Scribo Write Here is an absolutely fantastic pen in its own respect, but it gets so much better knowing that it's basically an Omas reincarnated. Having said that, it's probably one of the easiest and most affordable ways to get your hands on an Omas look-alike that features the same excellent nibs. 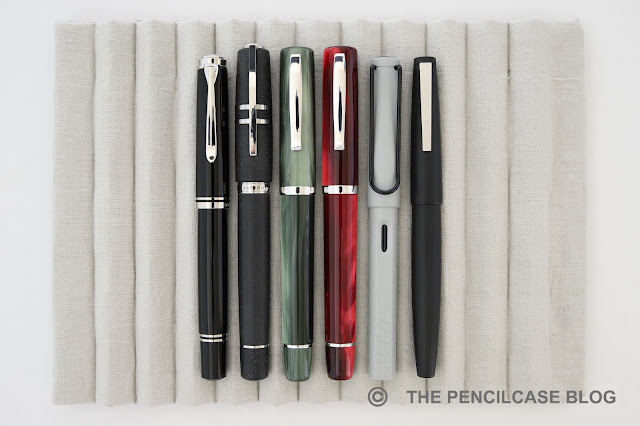 510€ Is not cheap by any standards, but still very much in line with what Omas pens used to cost back in the days. 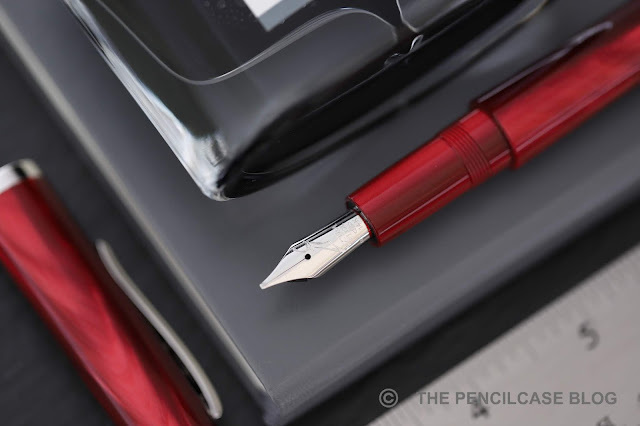 The Scribo Write Here is, of course, exclusively sold by Write Here, and it's a numbered, limited edition of only 50 fountain pens (10 green, and 40 red). Disclaimer: This post does not contain affiliate links.